If you’re just as bad as Sailor Moon in the kitchen, then this engraved rolling pin will surely come in handy! Spruce up the next thing you bake by imprinting patterns perfectly on cookies, pies, fondant and more! Take your most beloved Attack on Titan characters wherever you go with these Attack on Titan keychains! These super cute keychains each feature one of your favorite Survery Corps members and Titans in adorable chibi form. Show off your nation pride and love of the Avatar series with an elemental hoodie! These super soft and warm fleece hoodies sport the element symbol on the back, with the nation emblems on the shoulder and colors to suit. My Hero Academia Funko POP! 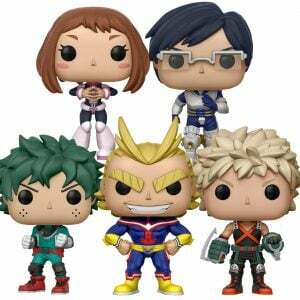 All of your favorite My Hero Academia heroes have been given a fun and funky, stylized look as an adorable collectible Pop! vinyl figure from Funko. The vinyl release offers fans their favorite characters with quirks from the anime series. Send your Mac into the Avatar State and cure you post series depression with this cool laptop decal! This one sized vinyl sticker can fit perfectly over most MacBook Apple logos, creating Aang to light up once switched on.